On this day in history, September 4, 1780, the Swamp Fox wins the Battle of Blue Savannah. Lieutenant Colonel Francis Marion was a continual thorn in the side of the British who occupied South Carolina. After a successful invasion captured Charleston in May of 1780, and much of the Continental Army's southern division was captured or killed at Camden in August, South Carolina was securely in British hands. Marion, a 5 foot tall veteran of the Cherokee campaigns of the French and Indian War, led a guerrilla style offensive against the British in the area. With only a few dozen men, Marion led one of the few pockets of remaining resistance in the colony, staging numerous attacks on British troops and their Loyalist co-conspirators. 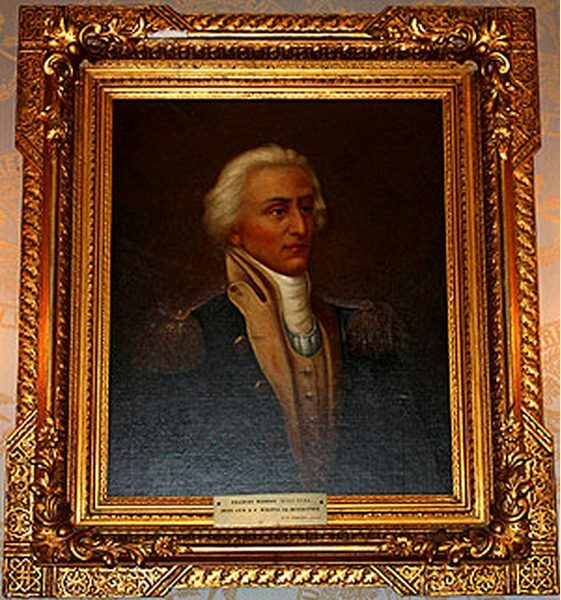 Marion earned the nickname, the "Swamp Fox," for his ability to elude British troops through the swamps in his home area around the Pee Dee and Santee Rivers. After the overwhelming defeat at Camden, Marion and his men freed 150 Maryland prisoners who were being taken back to Charleston. The soldiers believed the war was over, however, after their overwhelming defeat, and refused to join Marion. Marion then hid at a camp near Port's Ferry and learned that Loyalist troops under Major General Micajah Gainey were pursuing him. 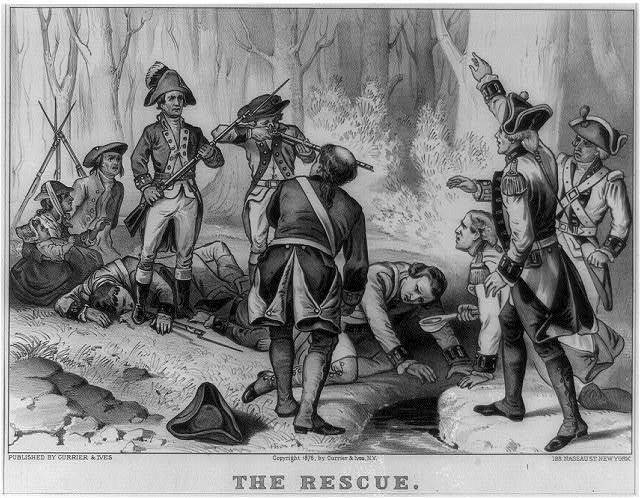 The Rescue This 1876 drawing by Currier & Ives depicts Marion and his men rescuing 150 captured Maryland troops from the Battle of Camden, causing the British to go after Marion and leading to the Battle at Blue Savannah. Rather than flee from Gainey's 200 Loyalists, Marion and his 60 men decided to attack them head on. On September 4, Marion's advance scouts ran into Gainey's advance troops and routed them. Marion then performed a pretend retreat to trick Gainey into advancing and quickly routed Gainey's main body of men. Gainey's troops scattered and Marion regrouped at Port's Ferry. The Battle of Blue Savannah, as it is called, served to break the back of Loyalist recruitment and military action in the Pee Dee and Santee Rivers area. It also encouraged the South Carolina militia to stand up and begin resistance again after the dreadful defeat at Camden. By the way, a "savannah," in the local South Carolina vernacular of the time, referred to a depression in the ground filled with water to make a small lake or bay. There are several of these depressions, surrounded by ridges of sand in this area of eastern South Carolina. Geologists believe the features may have been created by meteorite strikes in the distant past. The shallow depressions would fill with water which had a blue hue, hence the name "Blue Savannah." Today, the savannahs have largely disappeared due to agriculture and irrigation, but some of the depressions can still be seen by satellite, including the one where the Battle of Blue Savannah was fought. It sits roughly at the intersection of Highways 501 and 41 to the south of present day Marion, South Carolina.